These cookies originated in Europe and according to Joan Nathan, in her cookbook Jewish Cooking in America, their name comes from rugel, which is the Yiddish word meaning royal. They were also sometimes known as kipfel or cheese bagelach. In Europe the dough was usually made with butter or sour cream, but it could also be yeast-based. It was in America that rugelach began to be made with a cream cheese dough, which according to Joan Nathan, may have been created by the Philadelphia Cream Cheese Company. A traditional filling usually consisted of nuts, raisins, sugar and cinnamon; although today they are made with various fillings that range from chocolate to jam. 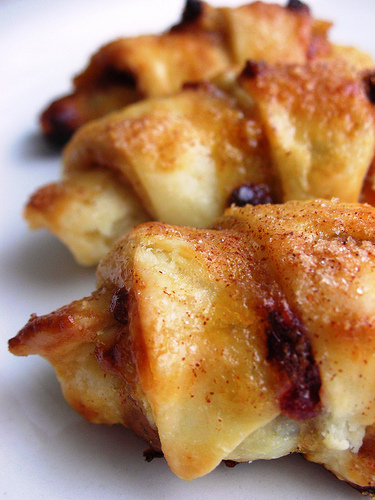 Rugelach have become so popular in North America that they can easily be found at many bakeries. However, making a homemade batch of rugelach is simple and will produce delicious results that people will not be able to get enough of. I made rugelach with a cream cheese dough because I prefer it to the yeast dough. The addition of cream cheese creates a dough that is light and flaky, which serves as the perfect counterpart to any filling. I chose to make my rugelach with a filling of walnuts, raisins, cinnamon and sugar, as well as with raspberry jam. Any other jam that you happen to have on hand would work in these cookies, as would some shaved chocolate. Both of these fillings that I used were delicious on their own, but the best rugelach turned out to be those in which I mixed the nut filling with the raspberry jam. The jam held the nut filling in place and was a nice addition that served to add some moisture to the dry filling. Easy to make and even easier to eat, homemade rugelach are a great snack and a delightful ending to any meal.